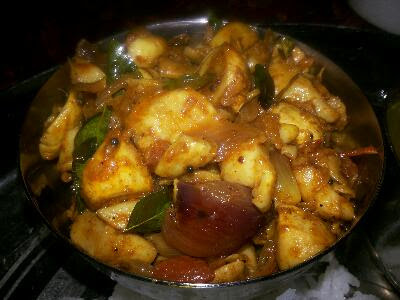 One of the super tasty accompaniments to hot steamed rice, Chappathis, Pooris, Parathas, Rotis, Idlis, Dosas and uthappams. Easy to make. 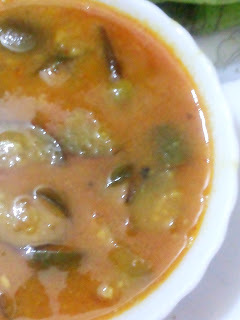 How to make this yummy Kuzhambu? Cut them into two each. Place them on the pressure cooker or pan and add 250 ml water. Pressure cook up to one whistle. Switch off the heat. Let it releases its pressure f its own. Take out the potatoes using a needle. Let them cool to room temperature. Peel off the potatoes and chop them into chunks. Heat the wok with Oil. Saute them on medium heat until the shallots turn translucent. Add Turmeric, Chilly powder (3/4 tsp), Coriander powder, Cumin Seeds powder, Pepper powder. Saute for a few minutes. Transfer the fried ingredients and fresh shredded coconut. Grind into a thick paste. Heat 2 tbsp oil on medium heat. Saute until the shallots turn translucent. Add turmeric, red chilly powder. Reduce the heat to avoid burning of turmeric and chilly powders. Transfer the potatoes and cooked chickpeas. Saute them on low heat. Add Ground masala paste. Add Salt. Saute them for a few seconds. 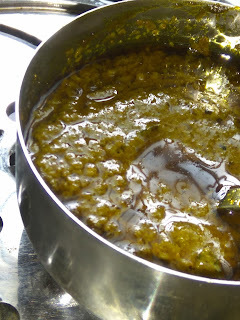 Add rinsed masal contents with water to the hot pan. Allow boiling and bubbling for 5 minutes on medium heat. Garnish with chopped coriander greens and turn off the heat. Stir for a few seconds to combine all the ingredients together.